This is the advance reading copy of New Mexico, Rio Grande, and Other Essays, published by the Graphic Arts Center Publishing Company in Portland, Oregon. 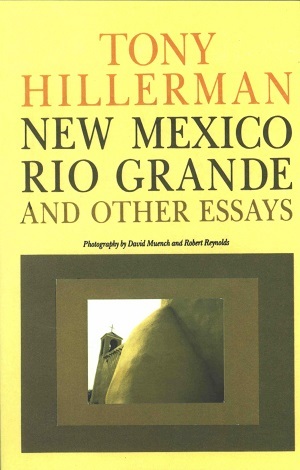 The half title page is stamped "uncorrected proof" and contains four original essays written by Tony Hillerman. The photographic images are not included in this edition but a border showing where the photos will be inserted does appear. The cover is a smaller version of the cover that appears on the hardback edition and features a photograph of the church at Rancho de Taos by Robert Reynolds. Format: Paperback, 20.8 x 13.5 cm. Binding: Paper covers with a yellow toned grey-scale photo on the cover. There is no printing on spine or back cover.